Attached to smart phones and tablets, the Millennial generation — those born between 1980 and 1992 — has been labeled lazy, entitled, and even incapable of engaging with the aging generations who grew up dialing a phone. But some civic-minded young people are proving their parents wrong. These creative young adults are thinking beyond themselves and keeping the community in mind — specifically the Alzheimer’s and dementia communities, using their skills to design innovations aimed at improving quality of life of patients and caregivers. When we talk about the future of Alzheimer’s disease, what we often talk about are the newest drug studies and diagnostic trials that are searching for ways to prevent, slow, or simply better understand the disease. But the truth is, even if we find a way to slow the disease, or eventually prevent future generations from dying from the disease, there will still be millions of people in the immediate future living with the disease. What if we were to refocus our approach to the disease and spend some of our collective effort on making the day-to-day life of an Alzheimer’s patient more dignified? Jenny Rozbruch and Sha Yao, two members of the Millennial generation, the arbiters of tech and innovation, are doing just that. Rozbruch and Yao both witnessed the progressive decline of their grandmothers’ cognitive abilities. As young women who valued their grandmothers and experienced firsthand the hardships of being a caregiver, they were motivated to utilize their design skills to create new technologies to help both caregivers and patients preserve their dignity and pride. Rozbruch attended the School of Visual Arts (SVA) in New York City, receiving a Master of Fine Arts in Graphic Design in 2013. While at SVA, she witnessed her grandmother, who suffered from vascular dementia, lose her short-term memory and independent functioning. Despite this loss, she remembers, “Throughout the years, I not only saw the hardships, but I also saw that my parents really treated her still with respect and dignity…they didn’t treat her like she wasn’t there…they really tried to draw out the functioning that she still had even though she really couldn’t care for herself or communicate very well.” Rozbruch and her mother would play traditional Yiddish music for her grandmother and flip through old pictures. She observed that her grandmother would respond to these activities – she would even start singing the words and humming the tune to the songs. In the midst of working on her thesis project, Rozbruch decided to “take all these elements and try to bring them into one easy place on the iPad.” As a result, GreyMatters was created. 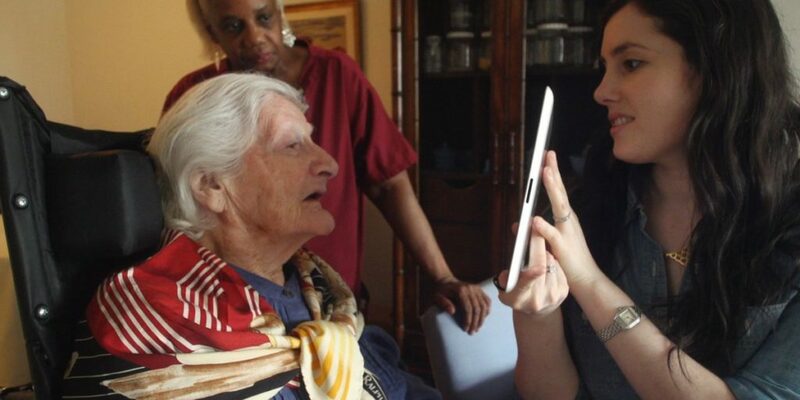 Rozbruch explains that GreyMatters is “a tablet application that aims to improve quality of life for people with dementia and their caregivers. Through an interactive life storybook, paired with music and games, the app helps patients and families preserve yesterday’s memories, as well as today’s joyful moments.” Rozbruch stresses the importance of focusing on the functioning that patients suffering from dementia maintain. That is the goal and fundamental philosophy of GreyMatters. Listen to Jenny Rozbruch explain her philosophy. Similarly to Rozbruch, Yao was a graduate student when the idea of her product — EATWELL — emerged. Born and raised in Taiwan, Yao moved to the United States in 2008 to study industrial design at the Academy of Art University in San Francisco. During this time, her grandmother suffered from Alzheimer’s disease, and although she could not always be in Taiwan to care for her grandmother, she felt the stress her family experienced while trying to balance their own lives with caring for their loved one. Driven by personal experience and by an innate desire to help people through design, Yao decided to create a product that would make life easier for both the patient and caregiver. “I like to make things, and I love to help people,” Yao says. “I listen to people and discover what their needs are, and try to use my profession of design to help them have a better quality of life. That’s my goal. I feel happy when I am able to work on meaningful projects,” she says. Yao created EATWELL, a nine-piece tableware set designed specifically for people with Alzheimer’s disease to eat without assistance. EATWELL won the $10,000 first place prize at the inaugural Stanford Center on Longevity Design Challenge in April of 2014. The challenge was to design “new solutions that will keep individuals with cognitive impairment independent for as long as possible.” Out of the seven finalists, the judges believed Yao’s product would have the most “immediate positive impact.” The tableware includes anti-tipping and slipping cups, slanted bottom bowls, right angle spoons, and a “good catch” tray that has a clip-on apron to catch food that falls between the table and mouth. These items are particularly designed to help people with Alzheimer’s disease eat independently and minimize the stress of caregiving. Sha Yao wants to help people using her Industrial Design degree. Listen here. Jenny Rozbruch’s grandmother had vascular dementia and Sha Yao’s grandmother had Alzheimer’s disease dementia — two different causes of cognitive impairment. But Rozbruch and Yao share a common experience —caring for someone they love who is suffering. For Rozbruch and Yao, the health issues of the elderly are not the farthest things from their minds, as some researchers may have us think. These two women utilized their skills as designers to create innovative products that benefit both the caregiver and their loved one who is suffering from dementia. Rozbruch and Yao believe that technology and design can create innovative, interactive products that will allow us to live with Alzheimer’s disease. As people age, it can become even harder to remember the countless passwords used in daily life.